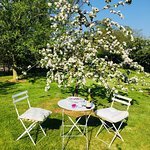 A wonderful friendly, peaceful, stylish place to stay - superb house and location, wonderful hosts, truly lovely room with everything you could possibly wish for, so peaceful, and an excellent breakfast. Unbeatable surely. Get quick answers from Rock Farm staff and past guests.